“Mayor Johnson is to be congratulated for publishing (even belatedly) his health study with a breakdown for every ward across Greater London of his estimate of 4,267 premature deaths a year due partly to long-term exposure to dangerous airborne particles. This report paints a shocking picture of the Olympic city. “Recognising the importance of this new information, the Mayor has today delayed by three weeks the closing date for the consultation on his draft Air Quality Strategy (draft AQS) until 13 August. 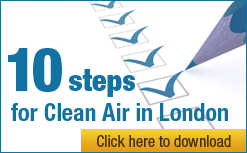 “For the first time every person, ward councillor and politician across London can see average levels of fine airborne particles in their ward and the premature deaths linked to it. The report also publishes a range of 756 to 7,965 with the ‘best’ estimate of 4,267 premature deaths. It confirms CCAL’s estimate of up to 8,000 premature deaths in London due to long-term exposure to dangerous airborne particles. “This report makes clear the worst air quality and greatest legal breaches occur in inner London and near our busiest roads. For the first time though it shows that air pollution is a problem throughout London. It may therefore come as a surprise to some in outer London who thought air pollution was not their problem. I urge people to see what the health study shows for their local area. “This report will have major ramifications for years to come. First, we need a major campaign to build public understanding of the health impact of poor air quality so people know how to protect themselves and reduce air pollution for everyone. Second, we need a much more ambitious air quality strategy from the Mayor (with urgent bold measures including much cleaner taxis, buses and one or more additional inner low emission zones (like the 40 Germany had by the end of last year)). Third the new Government must publish similar premature death estimates for the UK as a whole (in contrast to the failing or ‘cover- up’ by the previous Government, which steadfastly refused to do so), as demanded by Parliament’s Environmental Audit Committee in March this year, and publish redacted information hiding details around legal action from the European Commission about UK breaches of air quality laws every year since 2005. “Finally, Transport for London (TfL) which yesterday extended the consultation on the postponement of Phase 3 of the low emission zone (LEZ3) (due to ‘recent technical problems with the public consultation inbox’) by six days to 4 July must extend that consultation by a further three weeks or more to allow Londoners time to see this health study and object to the delay of this important measure intended to protect people across London. “CCAL will continue pressing the Mayor and TfL to release other information relating to actual and possible breaches of air quality laws that should also have been published with each of the ongoing three consultations (LEZ3, draft AQS and removal of the western extension of the congestion charging zone). The health impact of short-term and long-term exposure to dangerous airborne particles is believed to overlap to some extent although long-term exposure causes many more premature deaths than short-term exposure. Premature deaths can also be caused by short-term exposure to sulphur dioxide and/or ozone.